The Simple Life of a Queen: What a week! I'm so sorry I haven't been around to comment on your blogs this week. I wish I could say I would go back and try to read them all, but I'm not sure I won't miss a post here and there. I WILL try to catch up though. I promise. This picture below is why I haven't been online this week. I had to take my handsome husband to the emergency room Sunday night. He had emergency gallbladder surgery Monday and another procedure to remove "rogue" stones yesterday. I got to bring him home late in the afternoon yesterday. They said it was to the point his gallbladder was dying and then he would have really been in trouble. I didn't even know it could do that. Apparently he has been getting so sick he was vomiting for a couple of months now but he hid it from me because he didn't want to worry my with all of my heart "stuff". Crazy, silly man. He was SO SICK on Sunday night and his back was killing him too. I have never seen him like that and I didn't like it one little bit. He turned 60 last month and this was his first time in the hospital or ER since he was 2 year old. And both of the following two arrangements. 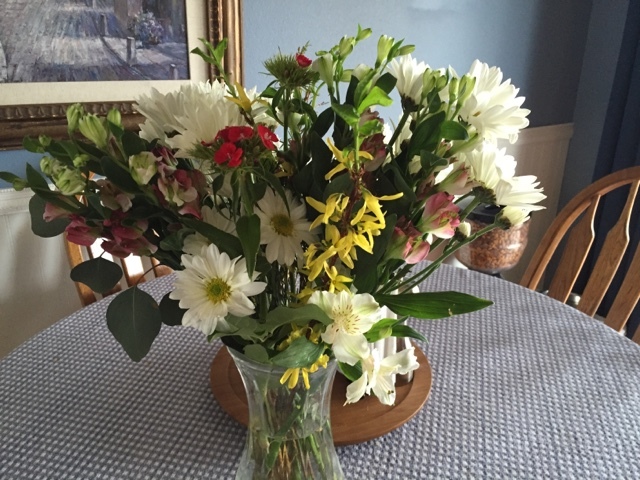 The florist actually had all of the flowers in these last two photos crammed into one vase and you couldn't see the individual flowers at all, so when we got home I separated them into two vases. 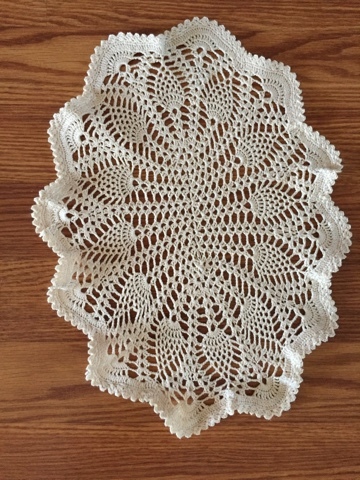 Here is the oval doily I ended up making for Lori. I think this pattern was from Pammy Sue. Thank you to everyone who sent me patterns and links. I gave it to Lori on Saturday and she loves it. 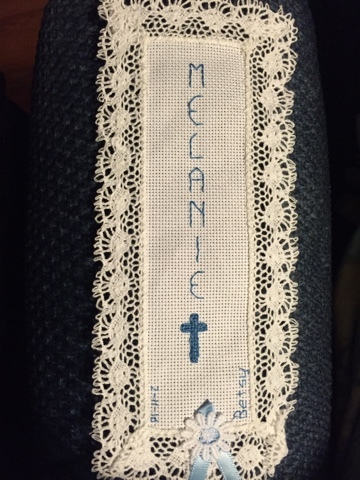 Today is my big sister's birthday and I made her this bookmark for her Bible. I sure miss her and wish we lived closer to each other. She's back in Iowa in the same little town we were born and raised in. I sometimes wish I still lived there too, but I LOVE the Pacific Northwest and the mountains. She sent me this for my birthday. 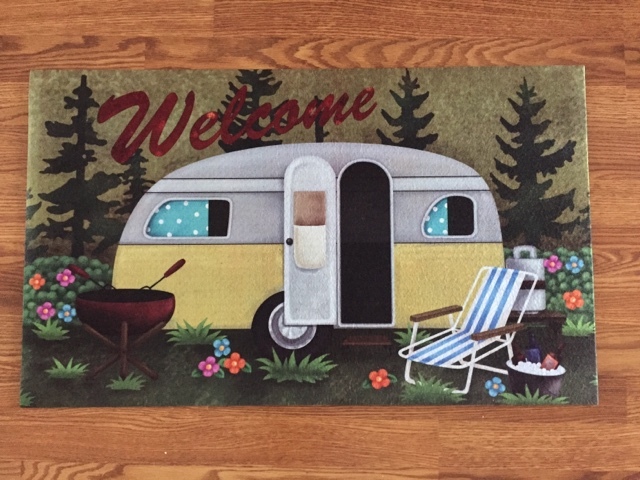 It's a doormat for the camper. She knows how much I'm looking forward to lake time this year. Mandy sent me this picture of her and Piper at the White House last week. One of her former co-workers from Portland was in D.C. for some meetings for work. They met up one morning and Mandy and Piper took her to see the sights. I love this picture of my happy girls. Well, God obviously had a reason for us not to go on that cruise. He used my heart going wonky to keep us here. Dennis was really sick last Thursday too, but didn't tell me. Can you imagine being that sick on a boat? We would have been at sea and he would have needed surgery. That makes three out of the four of us that have had something happen. I think Larry is a little worried. Ha! Ha! It was so good to be home together last night. I slept at the hospital in a chair for three nights because I didn't want to leave Dennis alone and came home every day to shower and change clothes. We were both glad to be in our own bed and slept very well. Mandy called, texted and face-timed constantly, as did Alex from Japan. 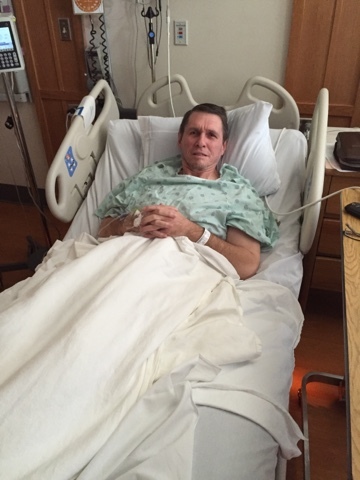 Jamie drove over on Monday morning from Montana and arrived while Dennis was in surgery. He stayed until this morning and just texted me a few minutes ago to say he was safely home again. 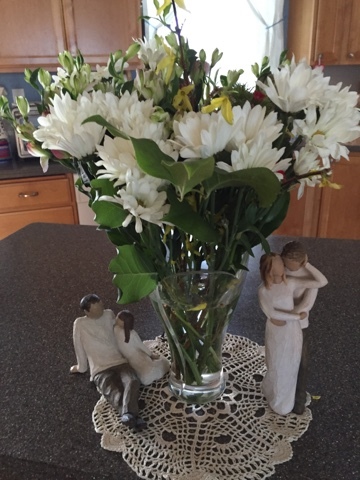 We have wonderful, wonderful kids who showed us this week just how much they love us even if they live far away. Our friends were here for us too, visiting, calling and praying. Have a wonderful Thursday my friends and I'll try to catch up with your blogs soon. Oh my you have been in it! I pray all goes well with you for the rest of the year. May God walk next to you both and comfort you as your need arises. Betsy, you and Dennis have been on my mind so much, I have been sending prayers your way for a speedy recovery. I can't believe he did not tell you what was going on! I am so glad it ended up getting taken care of before it was even a worse situation. You must have been so scared. I think you both need to REST, REST, REST. and REST some more. Take good care of yourself as you are tending to your husband. Goodness that would have been awful to be out to see and have to have surgery. They probably would have airlifted him. Glad you didn't go for sure. He looks a little miserable. I hope you both can rest up for a few days. Nice flowers. Oh my goodness, I'm sorry about Dennis's illness. I hope he's feeling much better now. How scary. I'm so glad he finally got help for himself, that must have been very hard on him. I'm thinking of both of you, take care of yourselves and each other. I'm sorry to hear your husband has been unwell, but glad everything has turned out okay. My husband had gall bladder issues a few years ago and was so sick. As soon as they removed his gall bladder he felt so much better. And I think having grown children who care about us is one of life's greatest gifts. Oh, Betsy, sorry to hear Dennis was in the hospital but glad he is out now and going to be ok. I don't understand why a husband would hide his sickness. I know he's strong but it doesn't help any when they need help. Your doily is lovely! Take care and have a restful weekend coming up. Prayers for you and Dennis! Hugs my dear friend. Thanks for your comment on my blog. I know a little of what your Dennis was suffering as my hubby had the same thing. SO glad you were in your hometown! Wishing him a speedy recovery...beautiful handwork! Praise God your husband is better. You are right about the boat trip...I bet Larry is worried! Sending prayers your way sweet friend. Blessings always. oh my, health wise things have been rough for you both. I hope the worst is over with now. Oh my he must be a real stoic as gallbladder pain is awful! So glad he is alright now and on the mend. I bet he is glad to be home too. Poor guy. At our age you cannot let things go! I'm so glad you got a pattern for your pineapple doily. 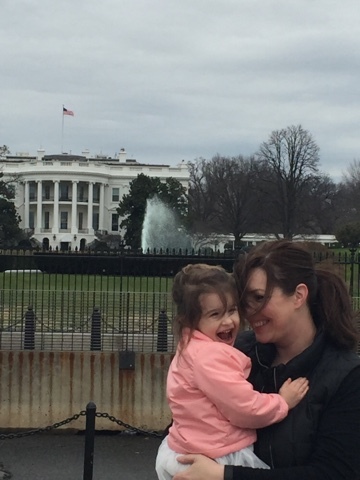 Great picture of Piper and her Mom in front of the White House. So glad all is well and yes, you have wonderful kids but that's because they have wonderful parents. Blessings to you and your family and happy Valentine's Day! Oh my gosh! What a scare! I am so sorry to hear about Dennis getting so sick, but as you said, there was a reason for you to be home, and not a cruise. I am glad he is doing much better now! The bookmark for your sis is beautiful. She will treasure it. And that doormat...oh my! I must get one!!! Loved seeing little Piper and her Mommy. Before you know it, it will be time to be on the lake! In the high 80's and low 90's here all week. I would prefer cold in February, but it has been awfully pretty. Sorry to hear about your husband's illness. I had gallbladder issues too, but being the wimp I am, I couldn't have hid it from anyone. Men are overly brave sometimes, I think. I am glad they got it out before it led to more serious illness. Happy Valentine's Day! I am newest follower. 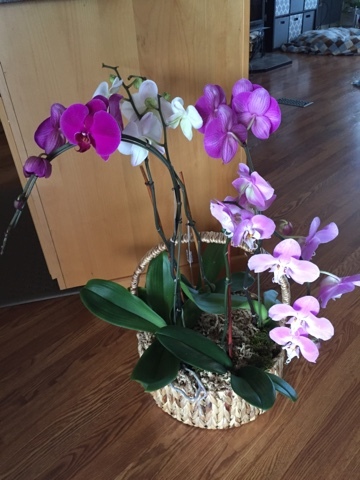 Sending you both get well wishes! Take good care. Your husband looks younger than that! So happy God saw to keep you at home and He knew you'd need to be there! Gallbladder pain is no picnic!! The White House gals are adorable. Hi Betsy, what fun and games! Health is never to be trifled with, and guess Dennis is glad of Gofs great mercy in all this as are you dear Betsy. A verse or two in Psalms fits the case in hand " my times are in Thy hands." And "Gods mercies are from everlasting to everlasting to His children..."
Love the mat for the lake, very snazzy, and also the oval doiley is just perfect.